Surrounding people note the serious Dog girl’s behavior. From the very birth of the baby, only parents deliver positive emotions. She tries not to bother the adult with her requests. Especially good relations with this sociable child with other children. A Dog girl is a loyal friend, she can be trusted with any secret. The truth is that it is very difficult to arrange it for yourself, it will not waste time on liars, deceivers and bully. The desire to constantly control their emotions is the main feature of the Dog girl. Can not open even to close people, thinks a lot about everything in the world, but rarely shares her observations. Tries to look calm, balanced girl, behaves with great dignity. However, it experiences constant internal tension. This obedient little girl does not want to upset her close people, so she holds back her negative emotions. Adults, though, rejoice at the diligent behavior of the girl Dog, but little praise her. Perceived as due her diligence and diligence, because she does not cause trouble, just quietly engaged in their own affairs. She eagerly responds to requests for help, rarely argues and practically does not express discontent. She is more concerned about the mood of the surrounding people than her own interests. It is surprisingly kind, sympathetic girl, completely devoted to her family. She is too shy and incredulous to easily make friends, so she often spends time alone. From an early childhood the girl the Dog differs wit, quickly learns all new. She draws the right conclusions, skillfully controls her emotions. This is a practically flawless child with a wealth of virtues. Sincerely refers to the surrounding people and does not know how to compliment. Often lies in the shadow of the more adventurous peers. She never pretends, she fights desperately for the truth in any situation. Sometimes it turns out to be in a disadvantageous situation because of its crystal honesty, is too demanding about others, and most importantly — to yourself. Surprisingly punctual and disciplined baby strictly follows the generally accepted norms and rules. Unquestioningly obeys the elders, parents can entrust her any case. She will not protest, ask for condescension, but simply silently begin to work. This is a very hardworking child, who does not work out of fear or desire to win sympathy. Girl The dog takes pleasure in overcoming difficulties. Sincerely happy to have the opportunity to express themselves, and even more — to bring joy to others. Baby Dog believes in good and justice, believes that everyone around her wants only good. After all, she herself does not deceive anyone, moreover she does not even think about it. But friends often use her trustfulness. Especially to mislead this naive baby is very easy. It is enough just a couple of phrases that she immediately rushed to the rescue. True, having made sure of deceit, she sharply stops communicating with the people who betrayed her. It has a strong character, but it shows its principled nature only in extreme cases. Among the peers girl Dog stands out for its sincerity and honesty. Even the most amazing stories that sound from her mouth turn out to be true. She does not see the point of exaggerating her dignity or looking for profit, coming up with a variety of circumstances. She simply lives without resorting to deceit and lies. She always answers honestly in class, if she could not learn her homework, she will immediately tell the teacher about it. Will not refer to non-existent diseases or seek other justifications. Parents can be absolutely sure of it, this girl is a decent person. Nature has awarded the little dog to not only with honesty, but also with secrecy. 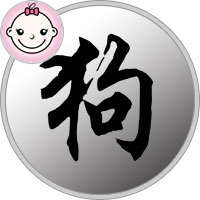 The child of this sign is distinguished by cheerfulness, benevolence towards all people. At the same time, she carefully protects her personal freedom, rarely allows anyone too close. She loves parents and friends, endlessly trusts them, but tries not to burden her problems. It’s easier for her to go through troubles alone with her, than to tell everyone about her failures. This is an amazingly strong girl, capable of courageous deeds. This little girl behaves very well, even ideally. Rarely cries, does not act up and does not ask unnecessary questions. Parents should remember that you can agree on anything with your daughter. It is important to behave honestly, not to lie and not to invent excuses. This out-of-the-year sensible girl will be able to accept any arguments and arguments other than lies. It always follows the schedule of the day, it is disciplined. Girl Dog should not be reminded that it’s time to go to bed or put the toys in their places. School teachers are well aware that they can rely on the girl in all things for the Dog. Be sure to fulfill the instruction of the teacher, and will try to achieve an ideal result. Respects teachers, so do not argue with them. Has a good time in all subjects, but loves more exact sciences. Has all the necessary qualities to study well. Among its advantages are excellent memory and sharp mind. In addition, she is diligent, in every case shows diligence and diligence. Parents can be proud of the success of their daughter. Teenager Dog becomes more restless, does not even try to restrain her feelings. It can be too emotional, it can burn out because of a trifle. Adults will have to get used to her desire to always defend their position. She is a self-sufficient girl, therefore she does not aspire to imitate peers. Parents can be calm for their daughter, she does not fall into a bad company. She pays a lot of time for studies and her hobbies, without unnecessary conversations, helps her mother in the household. She has no time to deal with stupid things. The Dog girl is devoid of ambition, it is much more important for her close people than her own ambitions. This trusting, affectionate baby needs love and care, she needs a strong leader who can lead her. It is parents who can become true and reliable friends for her. With the girl, the Dog is quite easy to get along, the main thing: do not lie. This child is so kind and generous that she can forgive everything except deceit. It remains only to love and indulge the girl Dog, it can not be spoiled by a good attitude.